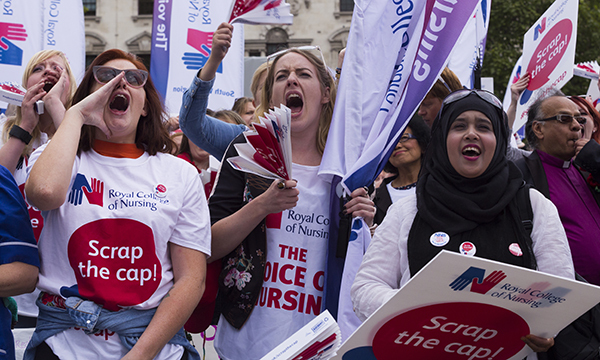 An independent review, instigated by the RCN, has found the college had ‘insufficient communications leadership’ to successfully convey the details of an NHS pay deal to members. Electoral Reform Services (ERS) has been investigating the RCN’s processes and communication over the pay deal in England, ahead of an extraordinary general meeting (EGM) of the college on 28 September. Its interim report published today acknowledges that the complexity of the deal presented challenges in communicating it accurately. It also found the college was under pressure from the government to back the proposed deal. Responding to the report, RCN council said: ‘We urge members to read these early findings before voting in the EGM. ‘They show that, in places, the RCN’s understanding and communication of the NHS pay deal in England was not of the standard that members should expect – for that we apologise again today. The EGM will enable all RCN members to vote on a motion of no confidence in the leadership of the college and call for RCN council to stand down. It was triggered by a petition signed by more than 1,000 members, arranged after some nurses did not receive an expected 3% pay increase in July. Information on which staff would receive the initial uplift under the deal was in fact not available until July, meaning the RCN’s assertions when recommending members accept the offer were ‘factually incorrect’, the ERS says. Former RCN general secretary Janet Davies, who stepped down following the uproar, previously issued a public apology over the confusion, stating that she had believed all members on Agenda for Change contracts would receive the 3% increase at the same time. The ERS investigation reveals that RCN council members also believed these members would receive 3% in July. Instead, the timing and amount of the initial pay uplift was dependent on when individuals joined the health service and their position on the pay band. The majority of staff will receive 3% by the end of this financial year. But ERS says some RCN members – those on band 3 spine point eight and band 4 spine point 15 – will not get the 3% by the end of March 2019. The report reveals that on 2 March Ms Irwin attempted to go through the deal line by line with the college’s executive team, but the time allotted for the meeting was insufficient to do this. Minutes also reveal RCN Wales director Tina Donnelly attempted to scrutinise elements of the deal during this meeting but was told by then general secretary Ms Davies that it was a deal for England and therefore input from other countries ‘was not required at this time’. Ms Irwin did later complete a line-by-line analysis with the RCN trade union committee on 7 March. ERS suggests it was during this meeting that trade union committee members gained the false impression that all members would receive a 3% pay uplift in July. A final report from ERS is due in the autumn.